There is something genius lurking its way to the surface in Darren Aronofsky’s PI – but it gets sidetracked with hallucinatory drugs. An indie film through and through, filmed in startling, scratchy black and white, with reasonably poor performances from everyone except the two leads – Sean Gullette and Mark Margolis (forever Alberto the assassin from SCARFACE, 1983) – with an ambitious idea that is not fully realized due to excursions down chemical alleyways and probably lack of budget. Sean Gullette is Max Cohen (geez, I wonder if he’s Jewish? ), a brilliant mathematician (are there any other kinds in movies? I mean, just once, I’d like to see an AVERAGE mathematician) who spends his days brow-furrowing over insurmountable math theory problems involving pi (defined as the ratio of a circle’s circumference to its diameter), while playing go with the assassin from SCARFACE. Anthropophobic, manic, paranoid, continually injecting himself and popping pills (with the odd hallucination of a drill to the temple) Max works at some problem that will bust open the stock market, if he can stay sane enough to outlast his computer crashes. Early sequences are interesting, where he describes Fibonacci spirals and how he plans to wield these numbers to strike gold. Max ventures out of his computer-cluttered apartment only for sustenance. 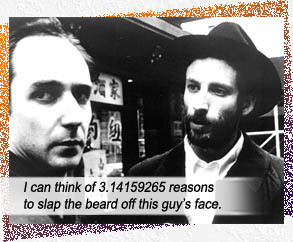 When he meets a pushy Hasidic Jew who looks like Jason Biggs in a fake beard (Ben Shenkman), he trips into a tangent of intrigue that makes his cerebral problems with pi seem irrelevant. And the soundtrack, coupled with his psycho-babble, makes for a jarring sidetrack into fantasia. On the verge of discovering something monumental, the Hasidic community comes after Max to discern the meaning of a 216-digit number that would reveal the true name of god. Writers: Darren Aronofsky, Sean Gullette, Eric Watson. Starring: Sean Gullette, Mark Margolis, Ben Shenkman, Pamela Hart, Stephen Pearlman, Samia Shoaib, Ajay Naidu.